General Electric is one of the biggest users of Oracle technology for Finance applications (HFM, Planning, Essbase, CM, ARM, FDMEE, ODI, DRM, Automic, Accelatis, Exalytics, Exadata). The GE Finance IT function has built one of the largest EPM Shared Service teams supporting 500+ internal applications. As such, among the 1750 participants from 500 companies, the learning and knowledge transfer contribution at the ODTUG KScope17 conference was invaluable. ODTUG is an independent, not-for-profit, global organization whose sole purpose is to keep the user community on the cutting-edge of the constantly changing Oracle technology landscape, especially the Oracle Cloud movement. The conference attracts the most Oracle ACE Directors and ACE Oracle experts as well as participants who are decision makers and influencers in their companies. The conference constantly evolves to include the best, the latest, and the most up-to-date educational sessions. KScope serves as a neutral meeting ground to exchange thoughts and ideas with Oracle leaders on how to make the products deliver to the best of their potential for all customers. To learn more about specific presentations at KScope17 click on the following pages. All presentations become available to members by September 2017. This year KScope was organized in San Antonio, TX. The GE Finance IT team presented 12 sessions, all in the EPM track. At the end of each session we felt participants took away a deep sense of pride to be able to work with such recognized experts, who always take the time to present the content in a fun and creative way while sharing very detailed and one of a kind solutions implemented at GE. Implementing the World’s Largest Exalytics Program – Gary Crisci (Principal Data & Information Architect at GE) is currently an Oracle ACE as well as the Treasurer in the ODTUG Board. At KScope16 he also won the Best Speaker Award in the EPM Business Content category for this session. Put Your Own Ribbon on Smart View – Gary Adashek (Sr Manager – Digital Operations at GE) won the Best Speaker Award in the EPM Reporting category at KScope16 for this session. Gary A. was also the organizer of the EPM Community Night at KScope17, a networking event for all EPM experts. One of the highlights of KScope17 for the GE team was the Oracle Ace title awarded to Gary Adashek. An Oracle Ace is an industry professional, recognized by Oracle as an established technical expert, who is also well known in the community. To become an Oracle Ace you must be nominated by a peer and submit to a rigorous review process. Many are nominated, but only a few receive this recognition. As you can see, Gary A. always goes above and beyond when it comes to his key KScope session; this year going for a train theme “Data Train, ALL ABOARD! Essbase Drill, OBI & Big Data”. KScope not only enables GE employee’s in increasing their Digital IQ, but it is also a great place to highlight the Finance IT team’s yearly accomplishments by showcasing them to the larger Oracle community. If you’re curious to see what a good abstract looks like check out the below example. A day before the start of the conference, KScope participants volunteer their time for an entire day towards a worthy cause in the local community where the conference takes place. During the same day, volunteers coordinated the Kscope STEM Kid’s Labs where children of various age groups could explore RaspberryPi technology, learn basic programming elements using a graphical language called Scratch, Minecraft writing Python scripts for creating cityscapes to constructing TNT pyramids. Other ways to volunteer your time is to help out in various activities of the ODTUG communities. At the end of each conference a Volunteer Award is presented as well, this year Adrian Png was selected as the most deserving member. Lend a Hand to the ODTUG community by volunteering some of your time! You’ll end up gaining much much more in return! After the KScope5K running challenge, a much needed fitness session organized at KScope was the morning Chi Gung session with Master Graziano who has been practicing martial arts for over 32 years and Chi Gung for 20+ years. He has volunteered his time for years to lead this everyday session, among many other activities. He can be found blogging about data, technology, and fitness at Oracle Data Warrior and on Twitter @KentGraziano. It was great to see how the ODTUG KScope values and dedication on Community Service, Health & Fitness, Women in Tech events, STEM programs for the young aligned so well with General Electric’s commitment to these same initiatives. The tagline for KScope’s 20th Birthday was “Work Hard & Play Hard”. Everyone had to follow the rules since the organizers had gone above and beyond to create a range of creative networking opportunities! The GE team always finds ways to connect with others in meaningful and long lasting ways, be it in a personal or professional level. 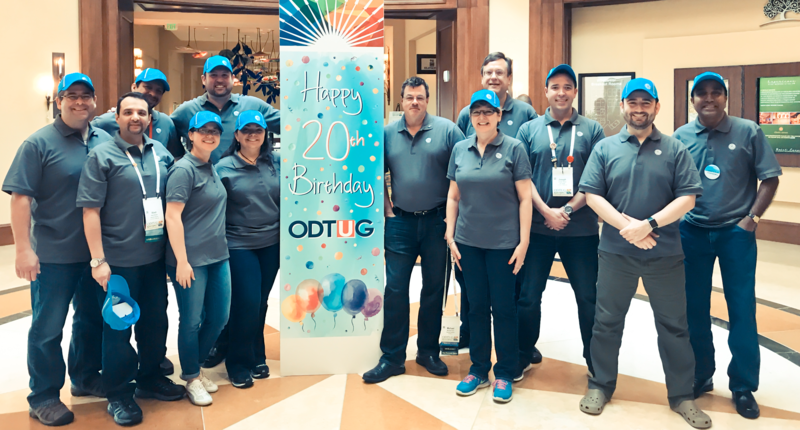 A Look Back at ODTUG #Kscope17 in San Antonio, TX! You enter KScope with the purpose to learn as much as you can about the Oracle technology and its usage, however you end up leaving with so much more: great use cases to apply in your projects and also special friends and mentors for years to come! Seems like there was a lot of spiraling going on in San Antonio… Unfortunately we didn’t get to try out the slippery one in the middle photo! Seems like it was everyone’s experience that every KScope brings you higher up in terms of knowledge transfer and networking. Every year the content, the sessions, the presenters get better and better. What happens after KScope is over? Well… from what I’ve learned this year… it’s not really over! The ODTUG community has established a social media presence through Twitter where hundreds of participants connect with each other to share well-written blog posts on their work accomplishments, suggest solutions to daily problems, talk about future ODTUG community meetups and keep in touch with one another.